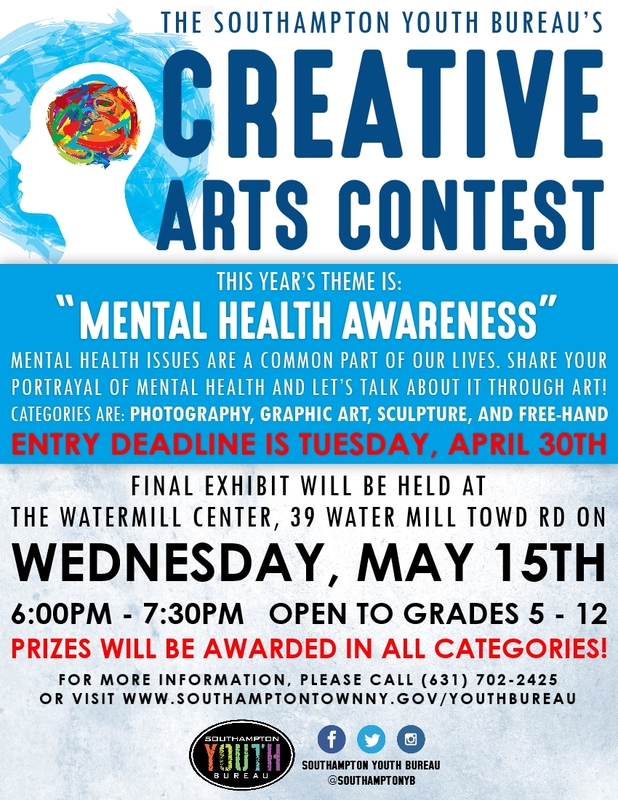 Description: Southampton Youth Bureau Creative Arts Contest: Mental Health Awareness at The Watermill Center in Southampton, Suffolk County, Long Island, New York. Mental health issues are a common part of our lives. The Southampton Youth Bureau's getting the conversation started about Mental Health through this year's Creative Arts Contest. The contest is open to students in grades 5 – 12 who reside or attend school in the Town of Southampton. Art work will be judged on quality, creativity and presentation based on the artist's portrayal of "Mental Health Awareness". All art entries (maximum of two entries per artist) must be dropped off at the Southampton Youth Bureau's main office at the Flanders Community Center, 655 Flanders Rd or at the Citizens' Response Center in Southampton Town Hall, 116 Hampton Road by Tuesday, April 30 2019. Participating artists are invited to bring their families and friends to the final exhibit at the Water Mill Center at 39 Water Mill Towd Road on Wednesday, May 15th from 6:00PM-7:30PM. Prizes will be awarded to the "Best Art Piece" in the categories of photography, graphic art, sculpture, and free-hand. Light refreshments will be served. For contest details and to view the registration form, please visit www.southamptontownny.gov/youthbureau or call 631-702-2425.